Box Text: Welcome to the Wild World of Sports. Fight or flight? The American Gladiators are ready to square off, and frankly they don't believe you're up to the challenge. But it's up to you to prove them wrong. Nitro, Blaze, Laser, Zap, Gold, Gemini and Lace are all ready and waiting to psyche you out of your game. You choose the order in which you'll compete, including: The Joust, The Assault, Powerball, The Wall and Human Cannonball. Complete all four levels and you'll get your shot on the ultimate battlefield where only the strong survive - The Eliminator! So if you think you're good, you better be great... 'cause these guys are BAD. 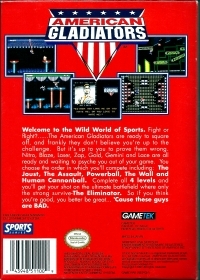 11-16-2012 exonerator Box Text Welcome to the Wild World of Sports. Fight or flight? The American Gladiators are ready to square off, and frankly they don't believe you're up to the challenge. But it's up to you to prove them wrong. Nitro, Blaze, Laser, Zap, Gold, Gemini and Lace are all ready and waiting to psyche you out of your game. You choose the order in which you'll compete, including: The Joust, The Assault, Powerball, The Wall and Human Cannonball. Complete all four levels and you'll get your shot on the ultimate battlefield where only the strong survive - The Eliminator! So if you think you're good, you better be great... 'cause these guys are BAD. 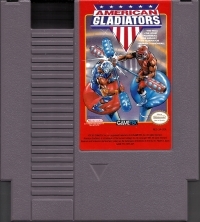 This is a list of VGCollect users who have American Gladiators in their Collection. This is a list of VGCollect users who have American Gladiators in their Sell List. 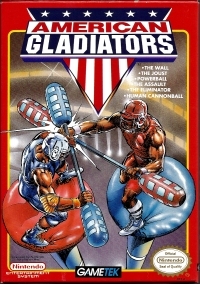 This is a list of VGCollect users who have American Gladiators in their Wish List.